Theremay be a bonanza of Earth-size alien worlds in the universe, scientistsnowsuggest ? nearly1-in-4 of all sun-like stars might have a planet roughly the sizeof Earth orbiting close around them. Thenew study found that there may be no shortage of planets withmasses ranging from five to 30 times that of Earth, conflicting withpreviousplanet models, researchers said. The findings also suggest thatsolarsystems with Earth-sizeplanets like our own may be common, theyadded. Astronomersstudied sun-like class G and K stars within 80light-years of Earth with the powerful Keck telescopes in Hawaii forfiveyears. Our sun is the best known of the yellow G stars, while K-typedwarfs areslightly smaller, orange-red stars. In all, they analyzed 166 of thesestars,split roughly equally between G and K.
Theresearchers looked for any minute wobbles in each starpotentially caused by planets between three and 1,000 times the size ofEarthorbiting closely around them ? just a one-fourth the distance betweenEarth andthe sun. Thescientists estimate that about 1.6 percent of the sun-likestars in the sample had Jupiter-sizeplanets,while 12 percent had super-Earths three to 10 times Earth'smass, the smallest currently detectable. This revealed a trend ofincreasingnumbers of smaller planets, suggesting that planets the size of Neptuneandsmaller are probably much more common than giants such as Jupiter. Toextrapolate further, "of about 100 typical sun-like stars,one or two have planets the size of Jupiter, roughly six have a planetthe sizeof Neptune, and about 12 have super-Earths between three and 10 Earthmasses," researcher Andrew Howard, an astronomer at the University ofCalifornia at Berkeley, said in a statement. "If we extrapolate down toEarth-size planets between one-half and two times the mass of Earth, wepredictthat you'd find about 23 for every 100 stars." Whilethe researchers spotted an additional 12 possible planets inthe new study, they have not been confirmed, said researcher GeoffreyMarcy, anastronomer at the University of California at Berkeley. Ifthose were included in the count, the team detected a total of45 planets around 32 stars. "AsNASA develops new techniques over the next decade to findtruly Earth-size planets, it won't have to look too far," Howard said. Howard,Marcy and their colleagues detailed their findings in theOct. 29 issue of the journal Science. Thenew findings conflict with current models of planet formation andmigration. "Theseresults will transform astronomers' views of howplanets form,"Marcy said. Afterplanets form a protoplanetary disk, researchers had thought only giantplanetsspiraled inward. Instead, where current models predict no smallplanets, theresearchers found a surplus. "Idon't know for sure what's missing from the models, but I have a fewguesses," Howard told SPACE.com. "One guess is that the disks of gasthat planets are thought to migrate within during the birth of solarsystemsare more complicated than the models allow for. Another guess is thatmanysmall planets in a solar system may undergo a phase of scattering offof eachother after the gas clears, a sort-of planetary billiard balls." Basedon these statistics, the researchers suggest NASA?s Kepler mission tosurvey156,000 faint stars for planets will detect 120 to 260 "plausiblyterrestrial worlds" orbiting near some 10,000 nearby G and K dwarfstars. "Thisis a first estimate, and the real number could be 1-in-8instead of 1-in-4," Howard said. "But it's not 1-in-100, which isglorious news." Whatare these planets made of? Theresearchers hope to learn much more about extrasolar planets bycombining theresults of their study with forthcoming data from NASA's planet-huntingKepler spacecraft. While their study can detect planetarymasses, Keplercan measure planet size with exquisite sensitivity. 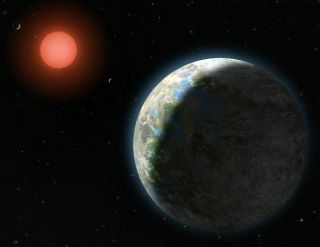 Sincethe astronomers only detected planets very near their stars,there could be even more Earth-size worlds at greater distances,includingwithin the habitable zone located at about the same distance as ourplanet isfrom our sun. Thehabitable or "Goldilocks" zone is the distance froma star neither too hot nor too cold to allow liquid water to be presenton thesurface. "Bycombining the planet masses with planet sizes, we'regoing to get a sense of the typical planetary densities and we'll beable tofigure out whether these small planets we're finding are made mostly ofiron,rock, water or gas," Howard said in an interview.